So you’re thinking about adopting a puppy to give as a pet to a spouse or a child. Unfortunately, there are many things that can go wrong with this scenario. Statistics reveal that there is a huge increase in adoptions just before the holidays, but there is an even bigger increase in abandonment of dogs and cats at local shelters, just a few weeks after. There are a few things that you can do to have a successful adoption and avoid adding to these statistics. Westport pet owners should carefully think out their plans, follow some of the tips below and, of course, bring any new pets to their veterinary clinic in Dartmouth for a new pet check-up with a South Coast veterinarian. Having a proper and healthy start for this new member of your family is always the best way to go. Before adopting a new pet, you should take time to research the breed or breeds that you are interested in having in your home. Some breeds require more attention, exercise and supervision than others, so it’s important to know what you are getting and match the breed with your lifestyle. Do you have kids? How old are your children? Do you already have other pets? How much time do you have to spend training a new puppy? Give yourself at least several weeks to research the various breeds to find the one or mix that is right for you and your family. Putting a cute puppy inside a box with a bow wrapped around its collar only works out perfectly in the movies. The reality is that the bow will get chewed off and the box will get peed in before anyone ever sees all of your efforts, and is that really the way you want to start off a new relationship? Plus, puppies can suffocate quickly even if the box is opened up right away. If you are getting a puppy for a child, bring the child with you to the local shelter to visit the available pets and pick the dog out together. Make sure that there is a connection between you, your child and the puppy. When it’s right, you’ll all just know it. Don’t fall for the “cuteness,” as all puppies excel in this area; make sure to find a dog with the temperament and energy level that best suits your family and your lifestyle. While it may just cost $100 or so to pay for the adoption fees, puppies come with a lot of extra costs that first time Westport pet owners may not fully understand. When you come for your new pet check-up, your South Coast veterinarian will put your puppy on a vaccination schedule, to make sure that he stays healthy for many years to come. Serious diseases, such as Parvo and rabies, require inoculations to keep your pet safe. Make sure to tell the veterinary clinic in Dartmouth if you will be boarding, traveling with or taking your new puppy to local dog parks, as there are other illnesses that can be prevented that are often contracted in these situations. Quality food, a comfortable bed, a dog crate for home and travel, collars, leashes, toys, treats – the list of things this tiny, furry little guy will need are endless. When you adopt a pet, make sure that you are making a lifetime promise that you will honor. Pets – like kids – go through phases. Puppies can be destructive and difficult to manage. Grown dogs can be obnoxious and disobedient. A chewed up couch cushion should not equal a death sentence, which is usually what follows when people surrender pets to the local pound. Make sure that you are committed to this puppy and will see him or her through thick and thin. Don’t make this promise without thinking it through. You need to be prepared for ten, fifteen or more years of love and caring, no matter what else happens or changes in your life. 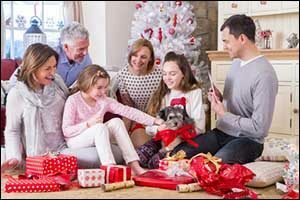 Getting a new pet even under the best of circumstances can be stressful, but with the holidays and all the lights, visitors and excitement, it can be even more difficult. Be patient with your new puppy, make sure to have a safe and secure place for him to rest if you will be having company, and do all you can to protect him from his own natural instincts. Keep him away from presents that he might damage, decorations that he might eat, treats that could be dangerous, and provide him with space as he learns to accept his new home and family. It’s an adjustment for everyone – including your new puppy. If you decide to adopt a new pet during the holidays or any time of year, contact Anchor Animal Hospital to schedule an appointment with one of our South Coast veterinarians for your new pet check-up. You can also call us to learn more about local shelters and programs in the Southeastern Massachusetts area that you can reach out to and find a new pet to adopt. Give us a call at 508-996-3731 or stop by our location on State Road in Dartmouth, Massachusetts.